The Republic of Rumi Blog: 9. Jauhar: the disciple of Zafar? In 1906, a representative gathering of Muslim leaders at the annual session of the Educational Conference founded the All-India Muslim League for participating in politics. 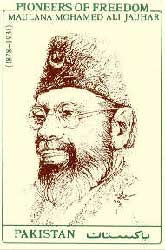 Muhammad Ali Jauhar (1878-1931), journalist, poet, political leader and promoter of patriotic songs dominated the community scene for the next twenty years. Interestingly, we find an unsuspected parallel between the careers of Jauhar and the last Mughal emperor Bahadur Shah Zafar. The emperor had helped disseminate poetry through recitals held at the Red Fort and Jauhar was possessed by a desire to disseminate ideas on a much larger scale: newspapers, gramophone records and political rallies. Jauhar practically founded ideological media among the Muslims of India. Both Zafar and Jauhar led freedom movements against the British: respectively, the first Indian War of Independence in 1857 and the Khilafat Movement in the post-WWI years. Both were tried by the British for inciting "mutiny" among the sepoys and both got buried outside their homeland: Zafar in Rangoon (now Myanmar) and Jauhar in Jerusalem. You can find out more about Muhammad Ali Jauhar at Wikipedia. What an interesting quote on wikipedia where he mentions dreaming of a federation "infinitely more spiritual than the United States of America."